Three days to go until our 'Fresh Fruit' mailing will tell all subscribers where to find excerpts from two final songs from the forthcoming Procol Harum album, The Well's on Fire ... to sign up, click here ... it's free! Four days to go until our 'Fresh Fruit' mailing will tell all subscribers where to find excerpts from two final songs from the forthcoming Procol Harum album, The Well's on Fire ... to sign up, click here ... it's free!
" ... the legendary band really is intact, as if they never had been away." Hands up, everyone who never thought this day would come! Are you going to any of the UK gigs in March? Let us know, perhaps we shall be able at any rate to find a suitable hotel for all UK visitors to book into for the gigs on 15 and 16 March, allowing us to get together in the bar at any rate, and to travel together between the gigs. Survey here ... only a trickle of responses so far. Five days to go until our 'Fresh Fruit' mailing will tell all subscribers where to find excerpts from two final songs from the forthcoming Procol Harum album, The Well's on Fire ... to sign up, click here ... it's free! Six days to go until our 'Fresh Fruit' mailing will tell all subscribers where to find excerpts from two final songs from the forthcoming Procol Harum album, The Well's on Fire ... to sign up, click here ... it's free! Are you going to any of the UK gigs in March? Let us know, perhaps we shall be able at any rate to find a suitable hotel for all UK visitors to book into for the gigs on 15 and 16 March, allowing us to get together in the bar at any rate, and to travel together between the gigs. Survey here. Nine days to go until our 'Fresh Fruit' mailing will tell all subscribers where to find excerpts from two final songs from the forthcoming Procol Harum album, The Well's on Fire ... to sign up, click here ... it's free! Quick! Pre-order the forthcoming Procol Harum album, The Well's on Fire, at a 17% discount from Amazon USA: just click on this link. We now have fresh supplies of the Palers' Project CD, Lost in the Looking-Glass. Please order! You can read Gary Brooker's praise for this double album of 40 Procol songs, revisited and reinvented, by clicking here; you can securely order the album by credit card or by PayPal by clicking here. All receipts help towards the costs of keeping 'Beyond the Pale' online, and further our work publicising Procol Harum to the world. As a result of this, 'Beyond the Pale' now has over 3,000 pages ... and each one of them a jewel, we think you'd agree! 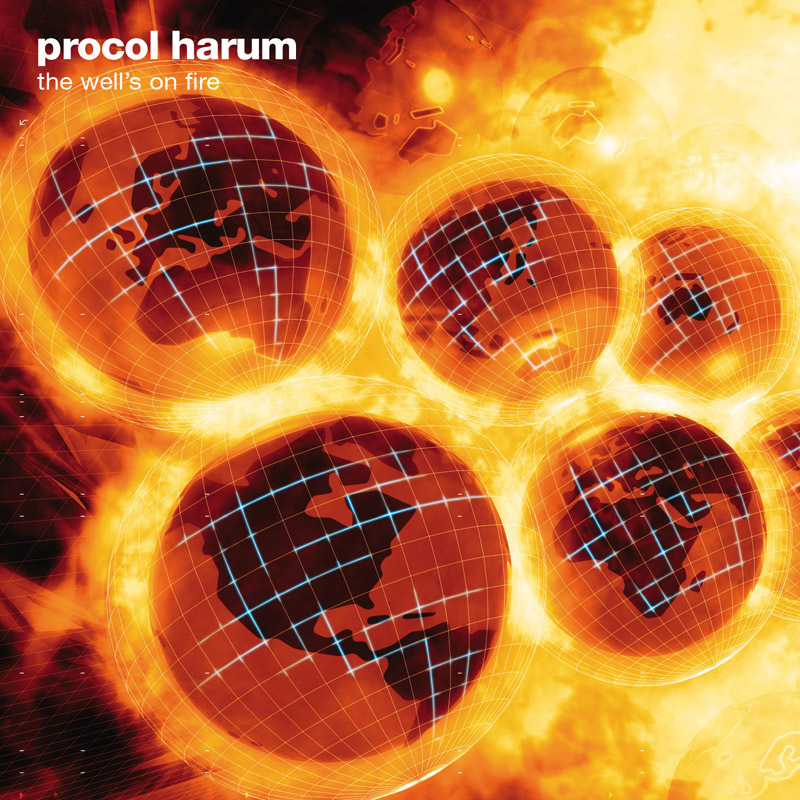 You can now pre-order Procol Harum's new album, Well's on Fire [sic] from Amazon USA using this link : please pre-order it now to propel the album into Amazon's 'Future Releases' chart ... in the hope that a high showing there may influence the way the album is promoted. Spend 25 dollars, and profit from Amazon's current free shipping offer. We have not checked to ensure that Amazon is absolutely the cheapest price on the net - but they usually have good prices and we do want to promote the new CD. Use Amazon, where any success in the much-viewed chart of future releases will give Procol Harum some valuable publicity! We now have a scan of the signed promo CD of The Well's on Fire, one of the prizes chosen by quite a few of the competitors in our Christmas Competition (thanks, Gary; thanks, Chris). Don't confuse this new release with the faux Robe of Silk 45rpm B-side that is depicted on one of our recent April Fool Hoax pages. Stuff at BtP is true except on April 1, or thereabouts. Last thing ... if you are planning to hear Procol Harum play at Milton Keynes, UK, don't delay your booking: BtP just spoke to the venue and there are fewer than 100 seats left. Later today we shall be sending out a one-off mailing of the Fresh Fruit newsletter. If you have subscribed to it by the time we mail out, you'll receive the location of two more pre-release clips from Procol Harum's forthcoming album, The Well's on Fire ... to sign up, click here ... but hurry! The newsletter also contains a reminder to North American fans ... if you'd like Procol Harum to play in your part of the world, please send your opinion to the band's management via this survey. 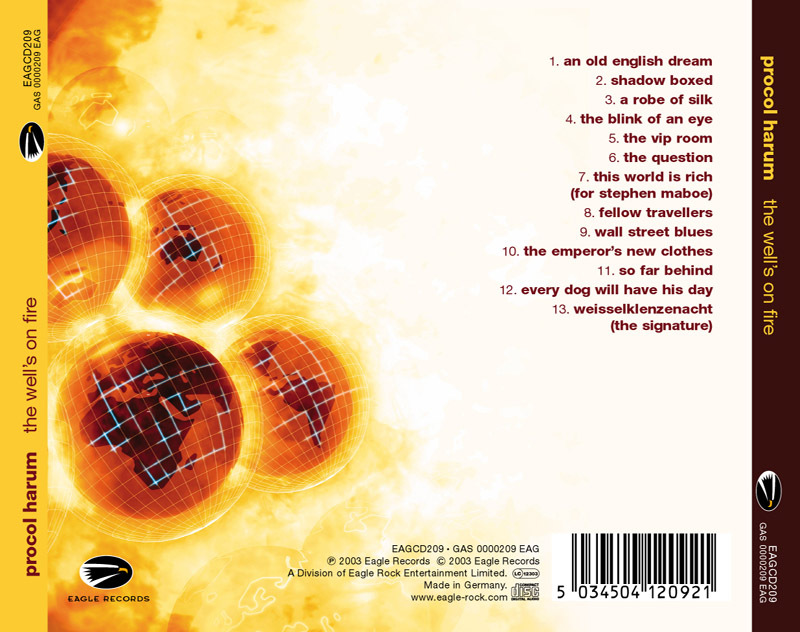 One day to go until our 'Fresh Fruit' mailing will tell all subscribers where to find excerpts from two more songs from the forthcoming Procol Harum album, The Well's on Fire ... to sign up, click here ... 'tis free! Here's a little riddle for you, since our Christmas Puzzles were so well-received: on 13 January we reveal ... to those who have subscribed to our Fresh Fruit e-newsletter ... pre-release excerpts from two more songs from The Well's on Fire. So the question is: which of the following titles (mostly BtP confabulations) is the real Procol song title: Underneath the Arches; Mind the Doors; The RIP Blues; The VIP Room; The Sword of Damocle's [sic]; The Custard Song; A Need to Know; Mind the Gap; The Bat Tattoo; Bird in the Hand; Turn out the Light Brigade; Mothers Ruin; The Clod and the Pebble. Answers to The Beanstalk, or thereabouts. Three days to go until our 'Fresh Fruit' mailing will tell all subscribers where to find excerpts from two more songs from the forthcoming Procol Harum album, The Well's on Fire ... to sign up, click here ... 'tis free! Four days to go until our 'Fresh Fruit' mailing will tell all subscribers where to find excerpts from two more songs from the forthcoming Procol Harum album, The Well's on Fire ... to sign up, click here ... 'tis free! The Well's on Fire has been doing well on Amazon UK and has been listed in the top 25 of most-sold unreleased CDs. Let's all pre-order our copy, and make the new Procol CD a Top 10 hit even before it is released. If you live in Canada or North America, do please fill in our survey, soliciting your opinions about a putative Procol Harum visit to North America. Be aware that what you fill in goes to Procol Management and may be used in helping to formulate a possible plan. We've had a good crop of responses but there must be many more Americans who could take a moment to sent some helpful feedback to Procol Harum. Five days to go until our 'Fresh Fruit' mailing will tell all subscribers where to find excerpts from two more songs from the forthcoming Procol Harum album, The Well's on Fire ... to sign up, click here ... 'tis free! Six days to go until our 'Fresh Fruit' mailing will tell all subscribers where to find excerpts from two more songs from the forthcoming Procol Harum album, The Well's on Fire ... to sign up, click here ... 'tis free! Seven days to go until our 'Fresh Fruit' mailing will tell all subscribers where to find excerpts from two more songs from the forthcoming Procol Harum album, The Well's on Fire ... to sign up, click here ... 'tis free! Tadaa: our lucky winners in this year's Christmas Puzzle. And now, at last, The Final Thrust(not a clue, Rich!) of this year's Yuletide Puzzlages. As soon as you have solved it, bang an e-mail off to BtP using the special link provided, and make sure it includes (a) the right answer and (b) the order in which you value and would like the fab prizes. But don't send your answer until you have carefully read the question! Eight days to go until our 'Fresh Fruit' mailing will tell all subscribers where to find excerpts from two more songs from the forthcoming Procol Harum album, The Well's on Fire ... to sign up, click here ... 'tis free! When these end, tomorrow, you will have one last easy question to answer, with a single word. As soon as you have this word, bang an e-mail off to BtP using the special link provided, and make sure it includes (a) the word and (b) the order in which you value and would like the fab prizes. But don't send your answer until you have read the question! We've slightly changed the way we're deciding who the winners are. The first three correct answers received after the last clue goes up will be allotted their first choice of prizes in traditional fashion. But after that, anyone who gets a correct answer in to BtP during a span of 24 hours will get their name placed once in a hat - a Homburg, naturally - from which we shall then draw the other ten winners. This new system - thrashed out by the BtP team over a protracted breakfast in Guildford - is designed to give hope to people whose servers cache pages, making it hard for them to access the final clues in timely fashion. Nine days to go until our 'Fresh Fruit' mailing will tell all subscribers where to find excerpts from two more songs from the forthcoming Procol Harum album, The Well's on Fire ... to sign up, click here ... 'tis free! As promised, added a survey, soliciting your opinions about a putative Procol Harum visit to North America. 'Beyond the Pale' would like to ask you, if you live over there, to fill this in very thoughtfully, and only once. Exaggerated or multiple responses will not help at all to bring the band over, in fact they will muddy the water and possibly create unrealistic expectations. So please do the survey decorously ... it's a great, one-off opportunity to make your opinions felt ... and be aware that what you fill in goes to Procol Management and may be used in helping to formulate a possible plan. Added to our Yuletide Quizlets with the rather straightforward Dose 9 ... be of good cheer, you're on the home straight now.